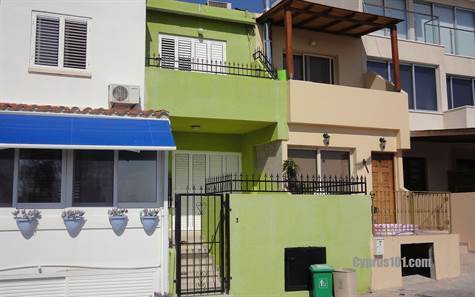 Geroskipou, Paphos - This 2 bedroom townhouse is located in the village of Yeroskipou which has a wide range of local amenities and is a short distance from the sea. The ground floor features an open plan living room with lounge, kitchen/diner and cloakroom. Built in cupboards provide useful storage space. Off the kitchen is a utility/storage room and access to a courtyard garden to the rear. At the front of the property patio windows in the lounge lead on to a spacious veranda with lovely rural and sea views. Upstairs are two double size bedrooms with fitted wardrobes and a family size bathroom. The master bedroom has patio windows providing easy access to a balcony with good coastal views. The property is suitable as a holiday home or for permanent living and has full title deeds. Please refer #1398 when inquiring.